As you all know, Khye is a very slow eater. 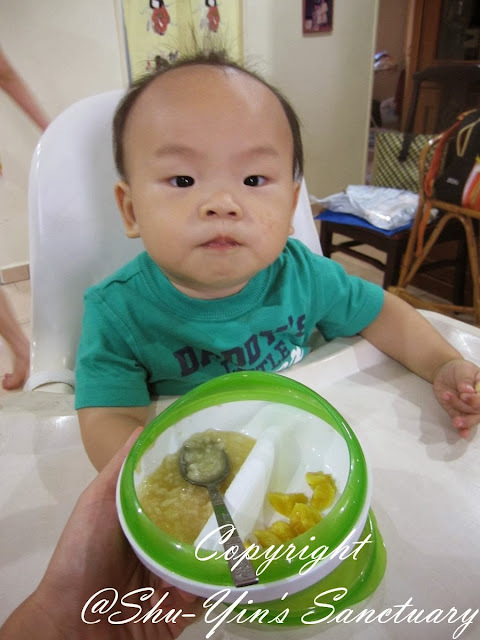 He was not ready for semi-solids at 6 months, and only stopped gagging and puking out food at 8 months, though he was still not very interested in food. He clamped his mouth shut most of the time when food was offered to him, only opening his mouth rarely for food. But it was progress although little. Khye only started voluntarily opened his mouth the moment he turned 1 year old. It was such an irony that my chubby little baby only started eating at 1 year old. Oh well, I guess every kid has its own time for everything. 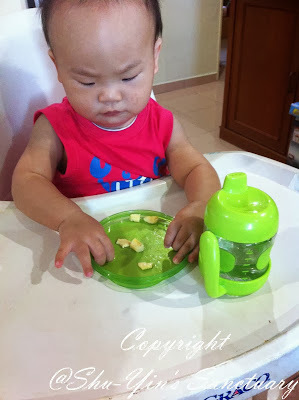 When Khye started eating, I was looking for a useful feeding dish to feed him, and this OXO Tot Divided Feeding Dish came just in time to try it out on Khye. 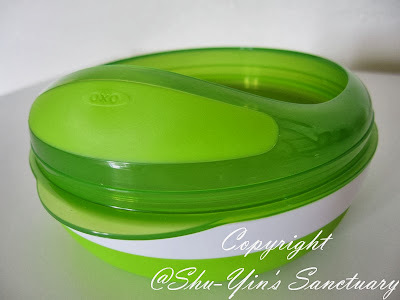 Just like the OXO Tot's Sippy Cup Set, it came in a hard plastic, with the very easy to open packaging. There was no need for scissors to cut away the hard plastic. There was a perforated line surrounding the feeding dish. I simply pulled the cupboard flap and it tore around the edge. Simply fantastic. I did not have to torture myself to cut up the hard plastic which usually ended up poking myself really bad. So I was really appreciative of the packaging. Upon opening, this is how it looks like when I snapped all 3 pieces of it together. The middle piece provides a cover for the food to conveniently stores leftovers.. I find it especially useful when Khye eats halfway and then wanders elsewhere to play and I can just cover the food up keeping it for the next feed. Another benefit that all 3 parts conveniently snapped together for storage, is that any one part won't get lost so easily. Lift up the cover and this is what you see. The aerial view of it front and back. 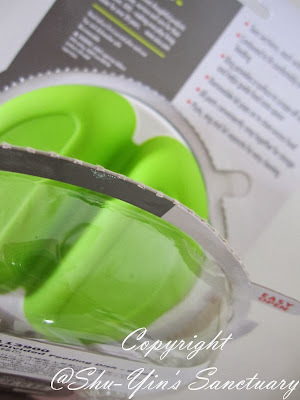 Yes, like the name, it is divided into two sections of 4oz capacity each, so you can serve 2 separate food at the same time, without it mixing up together and turn into a mushy mesh. 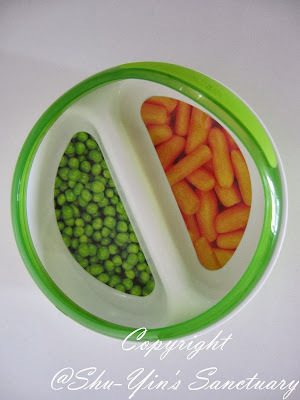 One thing first, I love this Divided Feeding Dish. Ok, let's see how I put it into good use. This is what I usually put into the dish to feed Khye when he was about 9 months old (after he finally stopped gagging and puking at 8mo). 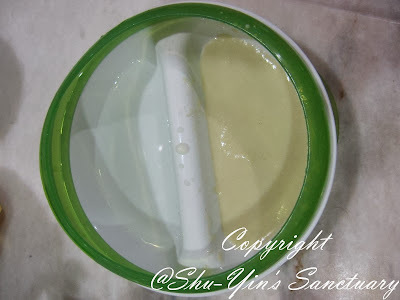 A more diluted rice cereal on one side, and some cooled boiled water on the other side. He would eat a little, though not very interested, but at least he did open his mouth and eat. 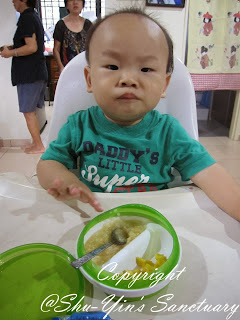 This divided dish helped a lot as I usually feed him some water after every few spoonfuls of cereal. I don't have to have a cup of water as I can have both water and cereal on the divided dish. As he grew older and a little more interested in food, I began serving him more food variety as he can take food in small pieces. However, Khye is a funny little boy. At that stage, he hated the spoon. So I could not feed him anything with spoon. I needed to finger feed him! 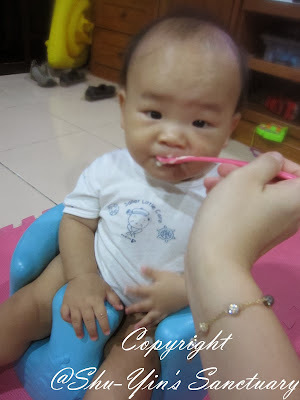 Basically is like this: If I put the food on the spoon to feed him, Khye would turned his head away and clamped his mouth shut. But if I finger fed him, he would open his mouth and eat it! What a weird and naughty boy! So I served him soft food, such as below. 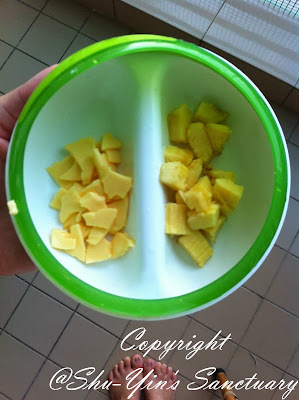 Small pieces of cheddar cheese on one side, and small pieces of bananas on the other side of the divided feeding dish. 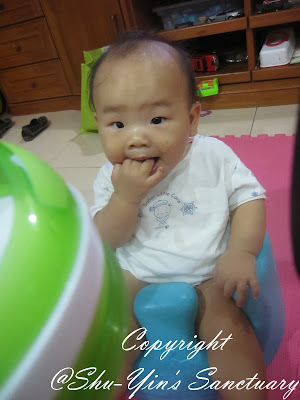 And Khye would finger feed himself too from the divided feeding dish with those cut up food. He would mess it up at times though. 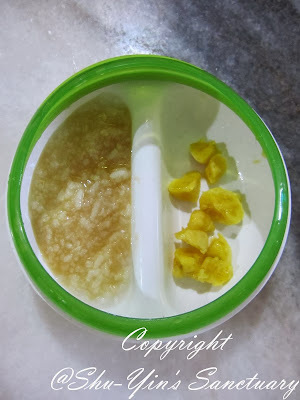 So that is when I feed him using the feeding dish, I would take the cover and flipped it, and I put some pieces of the food on the cover for Khye to self-feed. Not so much mess this way! Multiple use of the cover, haha. But now at almost 14 months, Khye and the spoon are now friends. 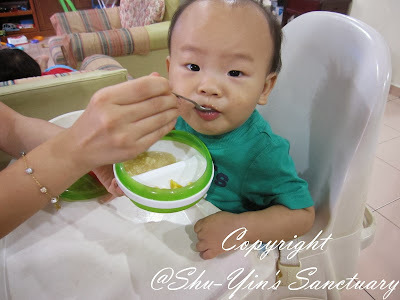 I can finally feed Khye 'moi' (porridge) as he now takes the spoon. But I still like to give Khye some varieties, and so I feed Khye some moi at one side, and some other fruits or such on the other side of the divided feeding dish. Me feeding Khye his food using the Divided Feeding Dish. The size of the dish is a nice size and fit comfortably in my hands. I like the rubber grip too at the bottom of the dish, as it won't slip off easily, giving me more confidence especially when I handle hot food such as moi. And with the green ring, it provides a surface to easily scrape off excess food. 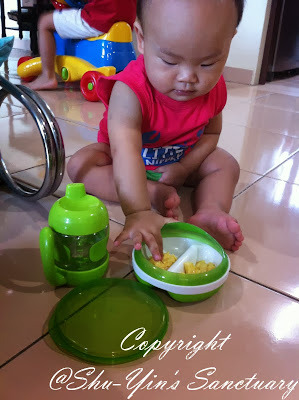 It also helps to guide the food onto spoon to feed Khye. 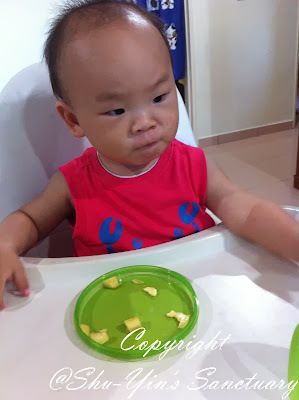 Khye eating his food and showing us funny faces! It is also microwaveable, how about that? I can also use it as a snack container sometimes by clicking the cover on. But I can only store snacks such as fruits or food that won't go soft as it is NOT airtight. In our hot and humid weather, food such as biscuits can go soft if we store them in a non-air tight container. So I wish the cover is air tight so that I can find more uses for this dish. Cleaning it is easy. Although made of plastic (BPA, phthalate and PVC free of course!) it is not oily and washes off easily with soap. And for those who are so lucky to own a diswasher, you may be happy to know that it is top-rack dishwasher safe! 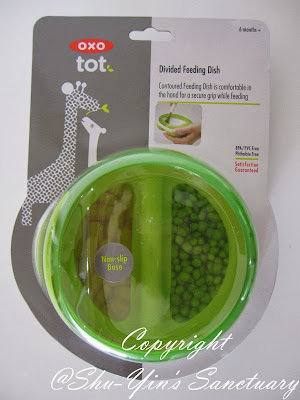 So I must say I'm happy with this OXO Tot Feeding Dish. 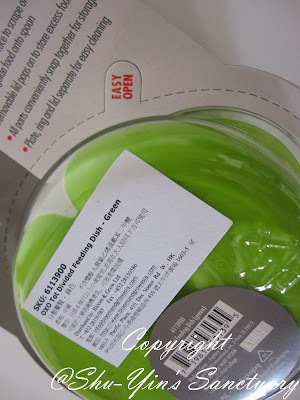 It's a good quality thick dish and I can see that it will last for a good while, even 'til my next kid! Haha. Please visit Bloom & Grow Asia for their list of retailers. You can also visit their Facebook page for more info. 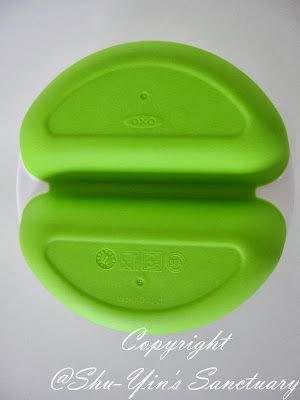 * Disclosure: I received an OXO Tot Divided Feeding Dish for review purpose, but no monetary incentive was received. All text and opinions are of my own and represents my honest opinion of the product(s). Shern's First Halloween with Trick-Or-Treating! Labour Of Love: Making Of The Train Costume!